Well here we are again folks. Another day, another case in this convoluted circus the Ace Attorney series calls court. This time with the magic of 3D! 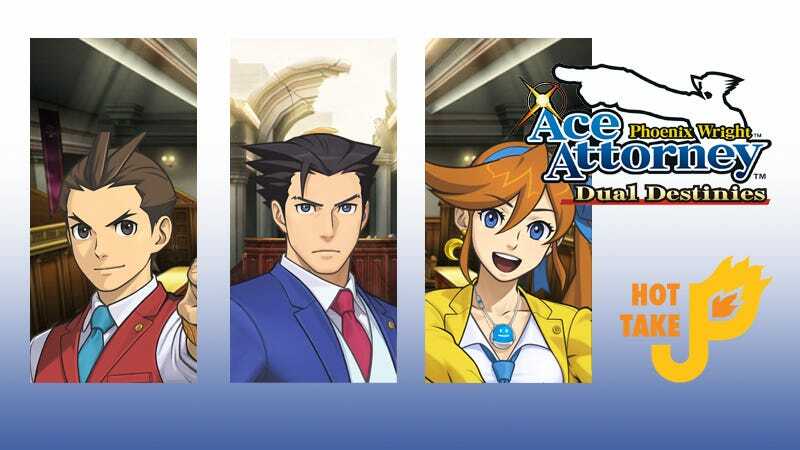 Dual Destinies is the beginning of a lot of new things for the Ace Attorney series. It’s the first that brought the games into 3D models. It’s also the first to be totally digital-only. And it’s also the first in a new post-Apollo Justice trilogy. How do these firsts change the way that players approach gameplay? Or does it stick to the original formula? First things first, it’s pretty much the same Phoenix Wright. If you’ve learned the traditional three-day trial system from the original you won’t need to relearn anything here. The only new addition is with Athena Sykes’ emotion-spotting necklace and the gimmick that comes with it. The emotion gameplay is shallow but passable. Like always there will be puzzles where you’ll be guessing the random answer rather than being led to it logically. Some of the quality of life changes make the game progress more smoothly, especially the dialogue log. Being able to go back and read what has been said previously in a conversation means players don’t have to ask a question a second time to re-read information. Athena, the latest member of the Wright Anything Agency, is interesting but I never felt like adding her was necessary. You’ll get cameos from plenty of other series staples, but the impact can be lost on players who haven’t experienced the games they debuted in. The transition to the 3D art style really works here. It adds a level of animation and dynamism to characters that the 2d art from the original couldn’t relay. Where the original trilogy left us with a deep cut, Dual Destinies didn’t dig much past the surface for it’s story arch. We’ll probably see it head in that direction as the new trilogy goes on. This was just laying the groundwork for future titles. In a lot of ways Dual Destinies is a great entry point for new players to the series. It introduces older material and doesn’t overwhelm with a story that relies on canon knowledge. On the other hand, veterans will enjoy the familiar zany cases and gameplay, despite forgettable gimmicks. Overall a solid experience.